What you see here is a woman cooking in an iron pot over a fire. It is hard to see, but the iron pot is hanging over the fire from an iron hook. The woman in the photograph is stirring the fire. This pot has three short legs so it can also stand on the ground where it can be heated with embers shoveled out of the fireplace under the pot. 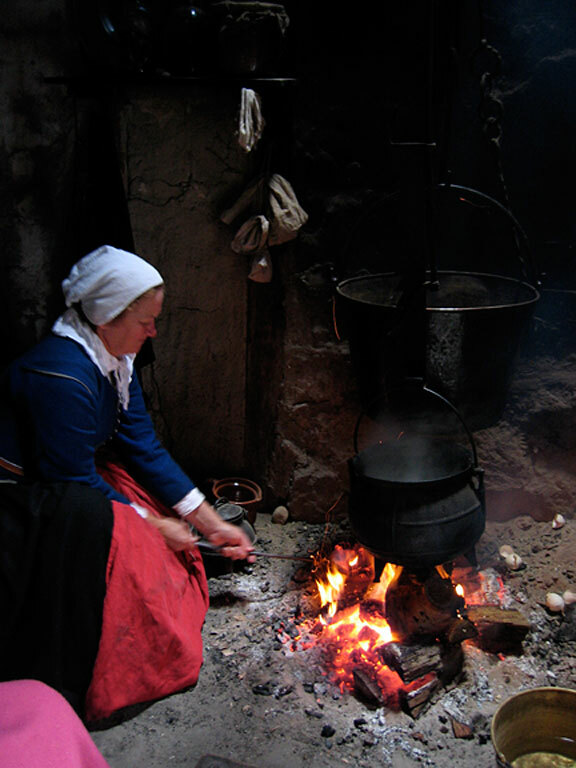 It takes a lot of heat to boil water so when boiling the pot would be hung over the fire. The fire is much hotter than a fire on kitchen stove. Thus, this water will boil much faster for pasta than would the same amount of water put onto your stove at home. When cooking something that is a little thick, something that could burn if the heat was too high, then this three-legged pot would be placed on the ground and heated with embers. Because the cook could exactly control the amount of embers pushed under and around the pot she could precisely regulate the heat. Sometimes there is no need to have any heat under a big iron cooking pot. If one wants the soup or stew or porridge to cook slowly then it is enough to just set the pot beside the fire. It will simmer on the side closest to the fire and that is enough. As far as the food cooking is concerned it really doesn’t matter whether a pot simmers on its side or from underneath, as it does when we heat pots on our kitchen stoves.